Today, we had the opportunity to visit ExxonMobil’s largest chemical facility in the world! Located on Jurong Island, in Singapore, this petrochemical plant is currently responsible for 25% of ExxonMobil’s chemical production worldwide. With a business friendly market and a strategic shipping location to their end user (primarily China), ExxonMobil Asia Pacific Pte.Ltd. 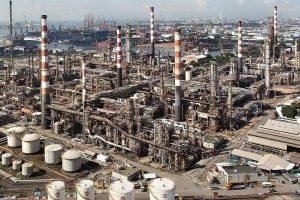 decided that Jurong Island in Singapore was the perfect place to take on two new specialty polymer units: halobutyl rubber and hydrogenated hydrocarbon resin. Before today, most of us knew very little about industrial chemical facilities, and thought of ExxonMobil solely in terms of oil and gas. But after our incredible visit to the Singapore Butyl and Adhesion Project (SBA), our eyes have been opened to the scale and complexity of petrochemical plant construction, as well as the broader reach of ExxonMobil as a company. Our journey to the main site office was a bit laborious, due to high level security (our bags were searched, our passports inspected, and name badges distributed). Once we made it through security, Dave Lake, one of the Area Construction Managers, gave us a safety briefing, reminding us that safety is the project’s number one objective. The second highest project objective was to protect proprietary technology, and thus no photos were allowed to be taken on site (so we took a photo in the office instead)! We then went on a bus tour of the SBA construction site, where Field Engineer Ray Fong&Area Project Manager John Coffin told us about the facilities. The site has two main facilities: the Halobutyl Plant and the Adhesives Resin Plant. One one side, the Halobutyl will be manufactured mainly for the use as air barriers in tires, as well as in some pharmaceutical applications. While on the other side of the site, hot melt adhesives will be made primarily for their use in common adhesive strips such as post-it notes and diapers. Finally, the Project Director, Mark Deflorio, spoke to us about his many international experiences working for ExxonMobil, dating back to 1980. He is the head of all operations for the SBA construction project, and it was a great privilege learning firsthand from him. We saw a small sample of the 4,300 workers (yes, you read that right) who are on site daily, most of which are migrant labor. 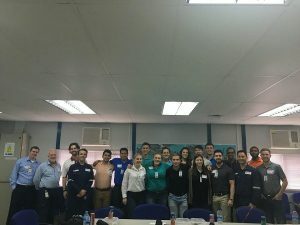 Since the workforce is comprised of such a diverse group of people, with more than 10 languages spoken on site, one of the project’s greatest challenges involves communication. In order to combat potential issues from potential language barriers, a safety meeting is conducted each morning in four different languages, and on site, many of the foreman and supervisors are bilingual. The contract for this project was awarded in 2014, and with over 14 million man-hours already completed, the project will be finished by the end of the Summer, with full operation the facility by the end of 2017. 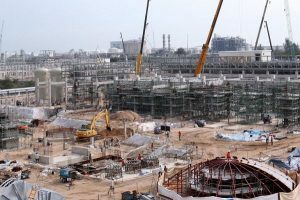 With a budget greater than $1.5 billion, and a focus on chemicals, a very foreign concept to most of us, it’s safe to say that this project was a lot to take in. However, we thoroughly enjoyed the office and site visit, and are still wrapping our heads around the awe-inspiring Singapore Butyl and Adhesion Plant.